This is a complete retexturing of the default Boeing 737-800 virtual cockpit (VC) textures in the color scheme used in the newest NG series aircraft. Smooth and shiny yoke, control column. The checklist on the control column is now legible as is most text in the cockpit. I repainted the gauges used in the Virtual Cockpit, only. I only have so much time, lol. I have revolutionized the VC, according to all the feedback I've received on Facebook...and I do believe I have. This is not to be repackaged or reuploaded under any circumstances. You want it...click THIS link and get it from me, only! Simplified problematic lights with static images. Also I may have had mixed up images for transparent and non transparent switches. Please read the readme for instructions pertaining to proper mixture lever settings for use. Again, original keyboard version also included. Adds automation to the fantastic Synthetic ILS developed by Karol Chlebowski for both glidepath and glideslope. Besides the automated ILS there is automated approach capability starting from about 15 miles from touchdown through landing. An automated takeoff function is also available. This was tested and worked on both P3D and FSX. Not tested on FS 2004. This is a retexturing of the 737 Virtual Cockpit. Overhead Panel, Glareshield Panel, Center Pedestal have black overlays and the cockpit walls have been "lightened". I created this to use in my 737MAX aircraft. VC TEXTURES ONLY. I have not repainted the 2D panel. This is a new panel for the Boeing 727-200 in 2D which includes a fully functional main panel, overhead panel, pedestal, and flight engineer's panel. It is based on the Boeing Airplane Operations Manual and is as close as possible to the real aircraft. It is designed to work on 1920X1080 monitors but should stretch to other sizes. It includes a full instruction manual and also cockpit sounds. There is a Virtual Cockpit which works on the Thomas Ruth FSX/P3D model only. Please read instructions before trying this panel. Automixture Switch for panels using Bjorn Kesten's excellent code for automix calculation. By his permission to freely distribute or modify. 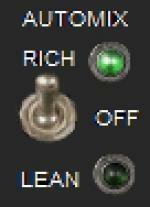 Select for either auto rich while climbing or auto lean for cruising. 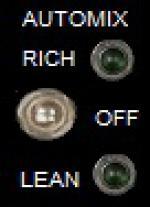 Indicator lights to show which mode is active. This is an extensive rewrite of my Boeing 737-800 panel published in 2015. It includes a lot of new features including a working HUD, a Yoke, a new fully functional Overhead panel, upgraded gauges, a cockpit sounds package, and a VC panel. It is designed for 1020X1080 (16:9) monitors although will work on other sizes with some distortion. It is tested on FSX and should also work on P3D. As always please read instructions. New FSX photoreal panel for the rare and beautyfull Heinkel He-112. Whilst my old panel addon from 2009 was a photoshop work based on a tiny thumbnail photograph my new panel is based on a good photograph of a extremly rare or maybe the only one restored He-112 instrument panel. The 2D-panel and the VC are totally matching and belongs to the pretty modell from A.F.Scrub. Panel and configuration from Erwin Welker.